Training Blocks allow you to rapidly generate blocks of training to suit the way you structure your strength sessions through to other planned data such as plyometric sessions or even bike session. The most important component is being able to build plans based on % of 1RM, Max Heart Rate or cadence. This enables you to easily generate a training block, apply it to multiple athletes and the correct 1RM or % HR Max is automatically calculated and displayed for the each individual athlete on their login. You can create, apply and access all of your training blocks using this button. To Create a New Training Block, click "Create New Training Block"
Click on Create new Training Block (as shown here at the top right of the page). Access, open then edit existing training blocks, delete or duplicate a training block (available on the left of the page, not shown in the image here) by clicking on the training block Edit button. 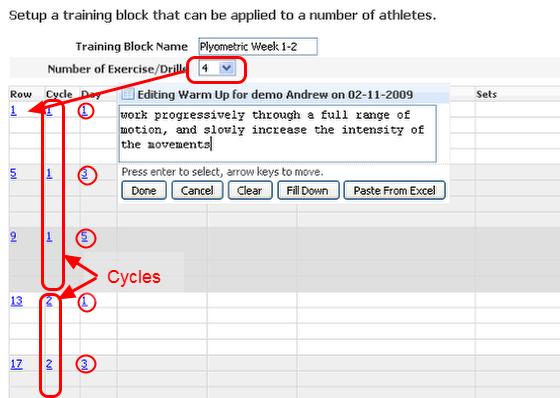 View/remove started Training Blocks for each athlete (discussed in the "Applying a Training Block" Section Help below). #1 Name: Name the block for future reference e.g week 1-4 GPP, or Vo2Max 6 week. You may be generating a lot of these so name it precisely. 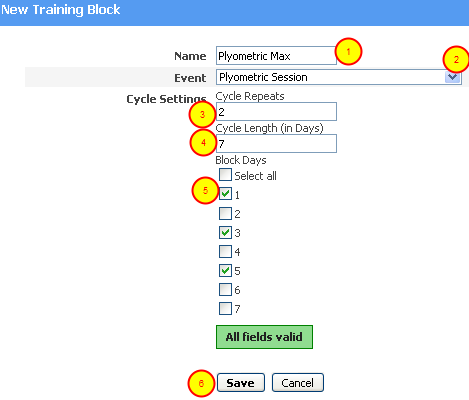 #2 Event: Select the event that you want to create the Training Block using. You can only select one event such as strength session, or plyometric session (however, you can apply more than one type of training block to an athlete). #3 - Cycle Repeats: Choose the number of Cycle Repeats e.g. a 2 week block (on a 7 day cycle length) would be 2, and a 4 week block (on a 7 day cycle) would be 4. #4 - Cycle Length (in Days): you can choose the length of the cycle. Most plans use a 7 day cycle, but you can choose the days that best suit your cycle. #5 - Block Days: The days of the block that you want to plan sessions for e.g. day 1, 3 and 5 could be applied to Monday, Wednesday, Friday or Tuesday, Thursday and Saturday cycle etc. This is the number of times that an exercise/drill/activity is repeated on a specific day, so that you can plan the correct number of exercises for an athlete. For this example we are going to use 4. This means 4 rows of data will be available to plan on each Day (e.g. 4 for Day 1, 4 for 3 and 4 for 5). The structure of the block is exactly as was specified when it was created it, and when the number of exercises were chosen. -Sessions are planned on day 1,3 and 5 as specified previously. -There are 4 Exercise/Drill rows to schedule (as specified in the Number of Exercises). Complete the information the same way you would when you enter data for a group, or when you enter data into any other table in the system. Click on any cell and enter in the appropriate information as defined by the type of information each field is capturing. Use the following buttons in each cell to enter or remove data: Done, Cancel, Clear, Paste from Excel, Fill down. Click on Cancel to prevent any changes that you have added to a cell from being changed. Click on Clear to remove any data/information in a cell. Click "Save and Close" and you will be taken back to the Training Block's Page (as shown below). Important: An Athlete's name will appear when you click in a cell to edit it. This athlete will NOT have this training block assigned to them. It is just a quirk of the system, so please ignore it. You can use the Fill Down button to automatically repeat data and it will include all of the rows of data that are above the row that you selected to fill down. It is not simply for duplicating the information down a column. You can repeat a sequence of rows down through the rest of the plan. In the image here, it shows that data from rows 1 to row 4 is going to be copied over rows 5 to 24. It is selected to "Overwrite existing data" and to "Copy entire row" which means that reps, sets, exercises etc will all be repeated throughout the table and any data that you have entered will be wiped. Make sure you select or deselect accordingly as you will wipe of all of your data if you choose to copy entire rows and overwrite existing data. You can see that the exercise rows have been "filled down" accordingly. The fill down button allows users to quickly build up their first cycle, copy that to the second cycle and then change an exercise, the intensities or repetitions. To speed up the creation of the training block, users can also Copy, Paste or Clear any Cycle or Day in the Training Block. They can also Copy, Paste and Clear the first row of each day only. 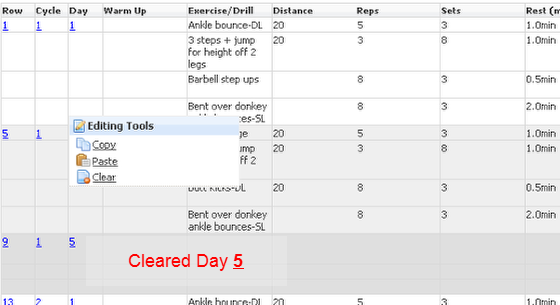 In the example above, we clicked on Day 5 and selected "Clear" which wiped the information planned for that Day. We then clicked on day 3 in the first cycle and clicked on Copy. To paste that information into Day 5 simply click on the 5 and select Paste. That data will be entered. Planning a session that has compressed field in it. Compressed fields allow you to significantly speed up the creation of a Training Block. Compressed fields are built into events/forms that have multiple sets/reps weight for a specific exercise/drill/activity. The form will either include this capability or not depending on how it was set up by your administrator. The image here shows a strength training block with compressed fields. 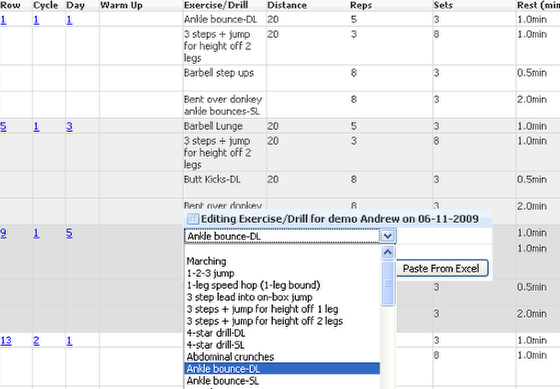 To enter data into compressed fields in the Training Block, users simply click the cell which says "Summary" beside the corresponding exercise that they require. 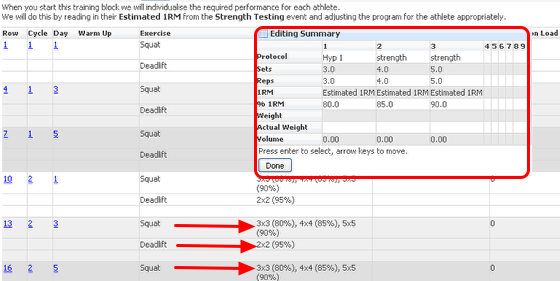 Another table will appear to enter in reps, sets, %1RM through to load or actual weight. Each column that a user enters in the new table will then be "compressed" and summarised as shown in the image above. To save the Training Block, you must click on "Save and Close" or you will lose all of your training block plan. If you are editing an existing Training Block and you don't want to save any of the changes you have made, click Cancel to lose all changes.